For that picky vegetarian among us there can be limited choices sometimes for a grill out. Try these amazing black bean burgers and have your meat-eating friends try to tell the difference! Mix garlic, cilantro, parsley, onion and salt in medium bowl. Mash 1 ½ cups beans in medium bowl, reserving ¼ cup whole bean for later use. Add bread crumbs, hummus, chili powder and whole black beans; mix well. Shape mixture into 4 (3-inch diameter) patties about ½-inch thick. Cover and refrigerate 30-40 minutes. Attach bottom grill plate to Grill & Broil. Lightly oil plate and preheat on HIGH Broil at 400°F. Place 2 patties on Grill & Broil for 6 to 8 minutes, turning over halfway through cooking. 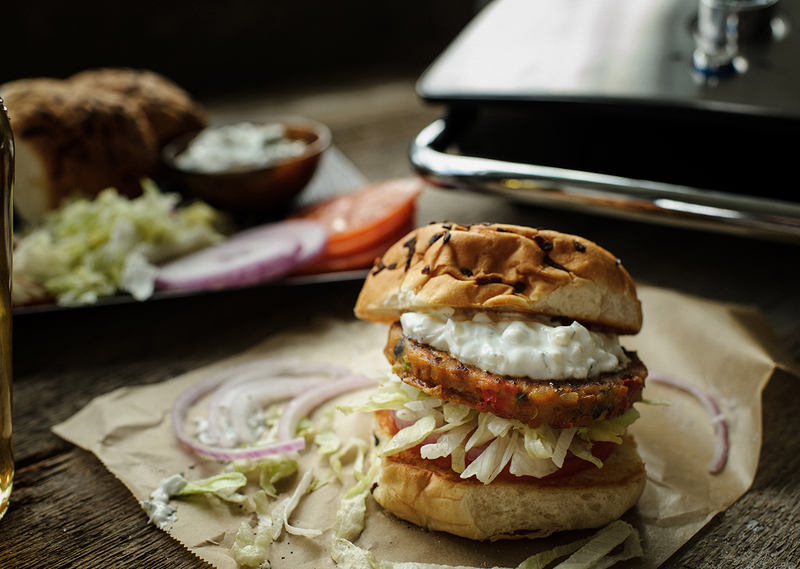 Fill buns with patties topped with tzatziki sauce.